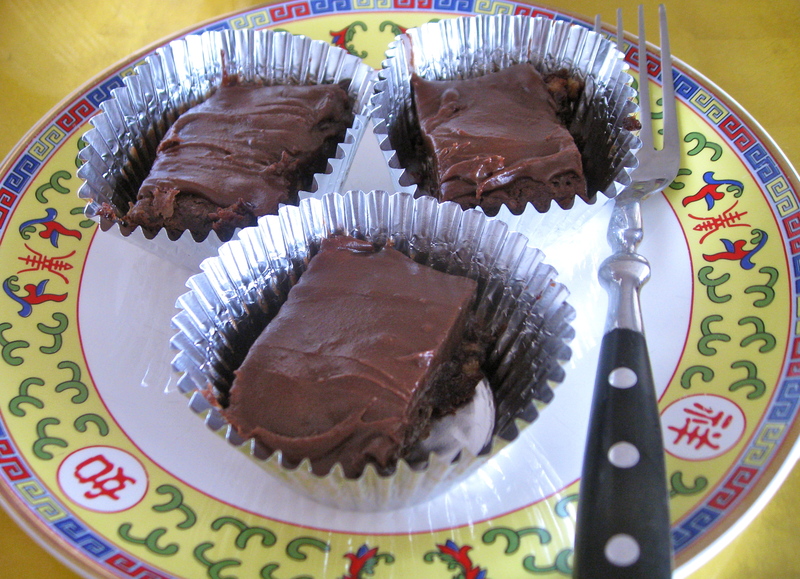 Like My Cookbook – It’s Easy! Recently I’ve done a lot of research on how I can increase visibility for my Chinese Comfort Food Cookbook. One thing I’ve read over and over is that the number of ‘Likes’ my book has on Amazon and on my Facebook page can greatly help in this endeavor. Liking my book title and fan page is very easy. Please click on one or more of the links to like my books and/or my Facebook Page. 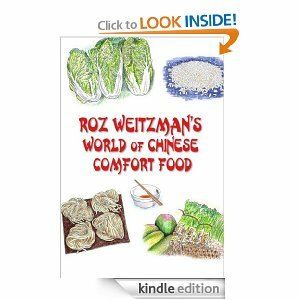 “Roz Weitzman’s World of Chinese Comfort Food” – a baby ecookbook has been born! The day has finally come, the day I was wondering recently if it ever would come! But yes, beginning in May, 2012, with seven long months in the making, and hundreds of emails back and forth to service providers (editor, photo-enhancer, illustrator, cover designer, ebook formatter, and online epub retailers), not to mention the dozens of re-writes and edits, cooking the recipes over and over again, and hours spent before May amassing the recipes and photos, a book is born. I have given birth to a bouncing baby ecookbook – “Roz Weitzman’s World of Chinese Comfort Food”! And it’s not a lightweight at over 16,00o words, 120 Word pages, 70 recipes and over 100 photos and illustrations. It’s just a thrill to know that the hard work has come to something; just knowing that I have been able to see the project to completion has been worth the effort. In about a month, I will be releasing an illustrated version, substituting illustrations for the photos. Plans for next projects you ask? 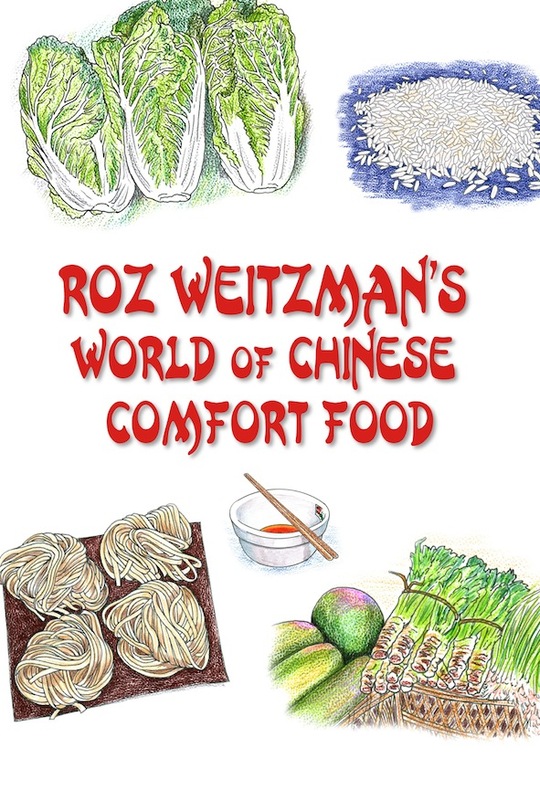 I have already started to compile and research the recipes for my next cookbook “Roz Weitzman’s World of Yunnan Food”. I still have my memoir on the back burner, the ideas percolating in my brain that would make the book a good read. The memoir is a combination of the trials and tribulations of the past, of growing up in a totally dysfunctional family, along with excerpts from my 100 plus, Letters From China. It’s heart warming and has a ‘happily ever after’ ending to the book. No need to purchase to write a review and many thanks in advance! Making friends with someone who cooks these vegetable balls has been a challenge since it’s more of a Northern China dish and I live in Southern China. I had found several recipes but – wow – the long list of ingredients and 150 steps in the procedure turned me off completely! Finally I watched the lady in my local wet market while she was making them to sell, and I got a good idea of what was involved, having eaten them so very often back in Beijing and Qingdao. So here you have it, my take on Chinese Vegetable Balls… This recipe is included in my Chinese Cookbook “The Secrets of Chinese Comfort Food – Everyday Chinese Cooking“, soon to be published. 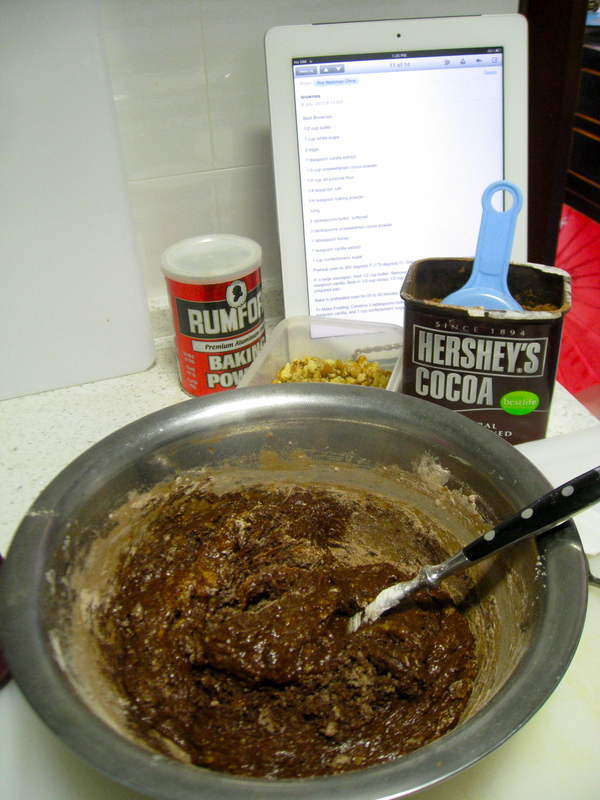 Mix all ingredients in a mixing bowl. More flour may be required if it’s too watery and to make the mixture stick together. Heat oil for deep-frying on medium high heat in a wok. When oil is hot, reduce the heat to medium. Lightly wet hands and form mixture into small balls. Add balls in groups of 5 or 6 to the oil and deep by turning balls frequently. Balls are cooked when they are lightly browned outside and firm in texture inside. Serve with sweet chilli, soy, or plum sauce for dipping. Today I finished my own edits of the Cookbook since my editor made revisions one week ago. I was stalled because the parents of my students took me to a resort on Fu Xian Lake for a few days. Now my editor has the document back for what is hopefully the final edit. it’s been a true labour of love – the amount of time I’ve sent on it is mind-boggling! One hundred pages of beautiful food – there’s a picture for each recipe (don’t even ask how much cooking I’ve had to do to get good pictures – good thing I enjoy cooking) and multiple pages for the title page of each section! Since I’m epublishing on http://www.smashwords.com, the document will go to a Smashwords editor who will then format it for the Apple Store, Amazon, Barnes and Noble, and for all other ereader formats. And I’ve also got some ideas for the last step – producing a book cover – which is my next project to complete. As if by fate, I stepped out of my apartment and bumped into Herri, my friend and neighbour from Germany on his bike, on the sidewalk going to the bank and for some shopping at the wet market. We walked together and he introduced me to some wonderful new food products that without an explanation in English I would never take a second look at. He was going to show me where to buy fresh sheep’s milk cheese at the new section of our local market. 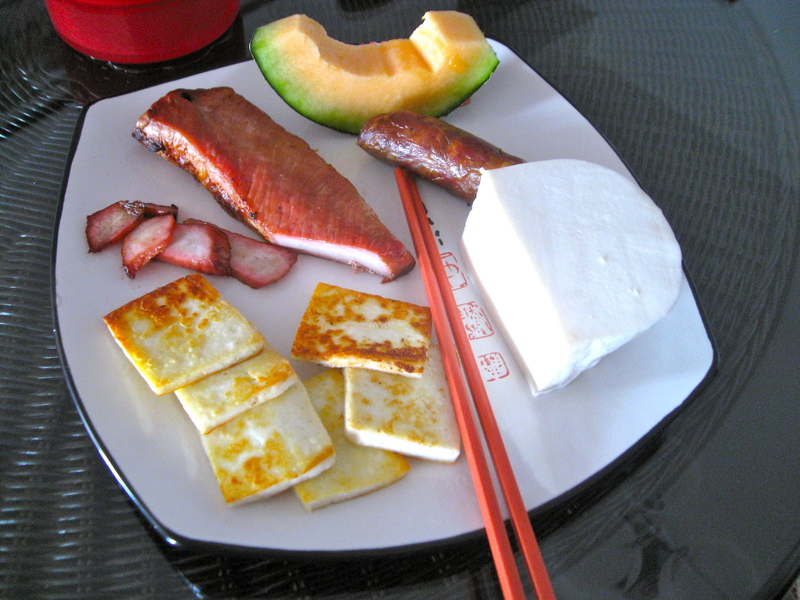 Sheep’s milk cheese with no additives, cured and lightly spiced pieces of pork tenderloin, and a special Chinese sausage, neither sweet nor sour or spicy were my special purchases. I sliced the cheese and the pork tenderloin and had the ingredients for my lunch today, topped off with some sweet and crispy Hami Melon, which is only grown in XinJiang Province in the West of China. These are the little finds that make living in China so very pleasant and interesting.